The Sikkim Public Service Commission, Is Appointing Eligible Male And Female Staff Nurse In Sikkim Subordinate Nursing Service under Health Care, Human Service and Family Welfare Department, Government of Sikkim, through Direct Recruitment, So Interested People Can Apply For This Job Within The Last Date, Which Is Mention Below. Kindly Do Check Out The Official Notification For Accurate Information, It's Provide Down Below. A. Number Of Vacancies & Name Of The Posts (ADVERTISEMENT NO: 01/SPSC/EXAM/2019). Staff Nurse (Male And Female) →200 Vacancies. 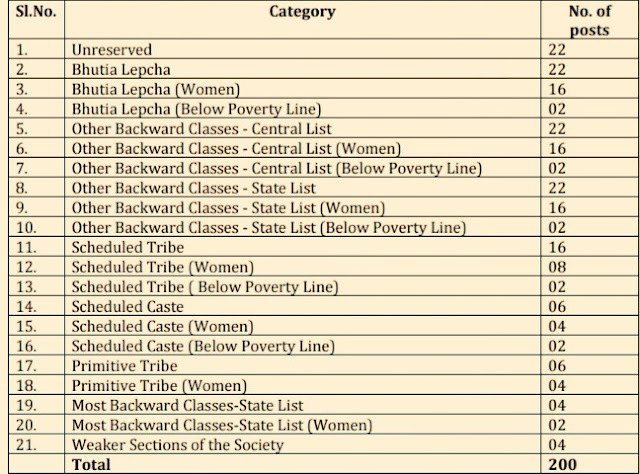 Total Number Of Vacancies →200 Staff Nurse Vacancy In Sikkim Public Service Commission 2019, Kindly Check The Image Below For Vacancies Distribution. (Credit - Sikkim PSU Notification -ADVERTISEMENT NO: 01/SPSC/EXAM/2019 DATED: 08/02/2019). Age Limit →Should have attained the age of 18 years, but should not have exceeded 40 years as on 31/12/2018, in terms of Notification No: M(3)/(55)/GEN/DOP/Pt-III DT: 03/07/2017. Educational Qualifications →a) Class XII examination passed from a recognized Board. Qualification: WITH b) Diploma in General Nursing and Midwifery (GNM) from any recognized Nursing Institute or any higher nursing qualification and registered with the Sikkim Nursing Council or any State Nursing Council approved by the Indian Nursing Council (INC). Mode Of Examination/Selection Process →Written Exam/Interview. Online Application/Examination Fee →Application fee amounting to Rs 150/- only may be paid online through credit/debit card, Net Banking by Visa/Mastercard. The amount once deposited shall not be refunded or adjusted against any other purpose. Candidates belonging to PWD Category are exempted from paying the fees. Last Date For Online Application Form Submission →23rd Of February, 2019. Admit Card Download →For Staff Nurse Sikkim Public Service Commission Admit Card Download, Exam Result, Kindly Do Check Out The Official Website Time To Time, Link Is Given Below. Now Apply For This Job Of SIkkim PSU 2019. Thank You For Visiting Here And Do Visit Here Regularly For More Info On Staff Nurse Jobs In Sikkim Subordinate Nursing Service Under Health, And More, Till Then Stay Safe And Blessed.